I specialise in full body Deep Tissue, Sports and Swedish massage. I am an athlete and Massage therapist with 6+ years experience. You will be very relaxed laying on a professional cushioned massage table. My technique is versatile and can range from soothing and stimulating gentle touch to deep bodywork. I have strong hands so be assured that your aches and knots will not be a challenge for me. Respect is paramount and I do not discriminate against any orientation...More, race or gender. 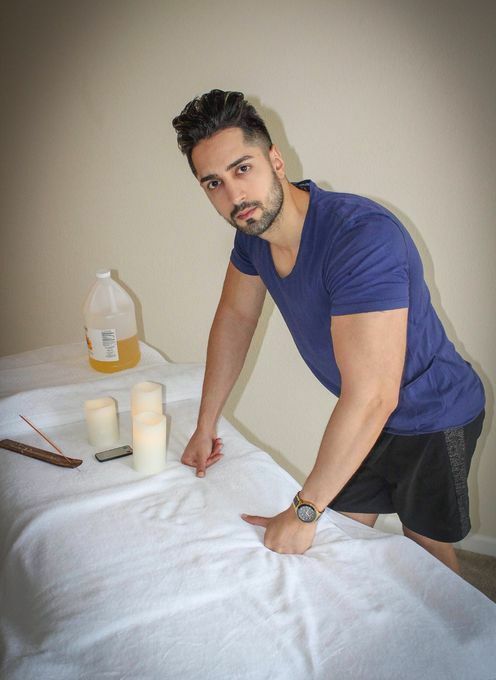 Whether you want to feel relaxed or relieve stress & aches, you can count on my technique. Hope to help you soon! ✅ There is a possibility to do the massage with 4 hands! Gathered by Paolo from admiring massage clients to share with you. I've had several therapeutic massages in the past, but none were quite like Paolo. There was definitely something different about his approach and touch. He was warm and friendly when we started and really wanted to know the 'why' I was there part. After telling him about my chronic lower back muscle issues, he went to work. His hands were so intuitive and strong, and his technique so unique. I left feeling really fantastic. Thanks paolo! I had the pleasure of a 4 handed massage with Paolo and Armano today. From the moment I arrived I felt comfortable. They work together beautifully and treated me as if I were the most important client they had ever had. Each has a slightly different skill which when blended together is like the perfect storm! From beginning to end it was perfection. Thank you Paolo and Armano! I don't normally write reviews for anything but I thought I would write one for Paolo and Armano as they gave me a great massage today. I had many masseurs from this site, their level certainly higher than the rest. I felt very comfortable with them. They used just the right amount of pressure which was super relaxing. They worked perfectly with their knees on my glutes. makes you feel great! My only complaint is that I wish I could have stayed longer under they magical touch. If they lived in my home town I would definitely hire they weekly. Amazing experience. Paolo is personable, experienced with massage. You won’t be disappointed. Truly the best massage I’ve ever had. I’ve had a 4 handed massage before but this was totally different. I appreciate their kindness and humor. They made me feel so comfortable and relaxed from the moment I walked in. I will definitely be making another appointment before they leave town. I took advantage of the 4 handed bodywork. This was a exceptional experience from both these guys... I have only experienced 4-handed massage 1 other time and they truly exceeded my expectations. Will definitely hire again and again. So professional!